Heavy restoration in the C19 makes earlier dates hard to establish. Most of the fabric is C14, but C12 and C13 work may be incorporated. Bodiam is best known for its castle, guarding the upper valley of the eastern Rother. The village was originally on higher ground to the north where the church still stands, now surrounded by woods. 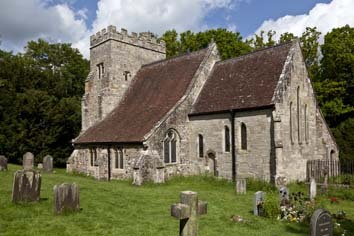 It was originally a chapelry of Ewhurst (4 p74). 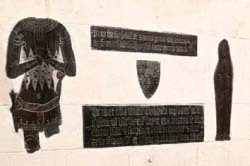 The Burrell Collection (1788) and the Sharpe Collection (1797) drawings show nothing older than the C14, but the darker stone at the base of the oblong tower may be C12 (SNQ 16 (May 1965) p126). The chancel has three south lancets with sills rising from a lowside to the west and a single north one is blocked by a C19 vestry. A C13 date is thus likely, though the elliptical head of the blocked south doorway and large blocks of local stone in the south wall recall work in the C14 castle, which also has plain lancets, though these probably demonstrate the greater conservatism of military builders. If the C12 and C13 datings are accepted, it follows that dimensions of the relatively short nave are contemporary, though any link between the later C14 work and the castle is conjectural. 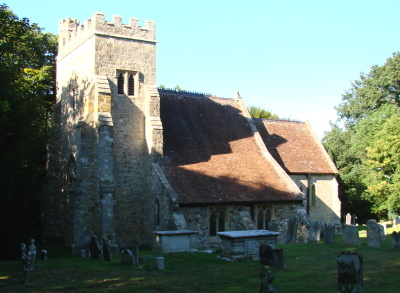 A legacy in 1382 to the novo fabrice [new fabric] (SRS 41 p161) is consistent with the architectural evidence – an aisled church with a tower, typical of the Kent-Sussex borders with big angle-buttresses. The Burrell drawing shows a west doorway, now only an outline, and a window of C14 type, smaller and higher than the present one. The bell-openings have been altered (the present west one looks like the former west window, but is unlikely to be re-used). The differing forms – two separate trefoiled lights to the east and a square-headed two-light one to the south, with none to the north – is original. The top, though heightened in the C19, still has battlements. The Sharpe drawing shows a battlemented south west stair turret as today, but, curiously, the Burrell drawing does not. Neither bears out a reference to a conical top said to have existed in 1856 (Eccl April 1856 p157). The tower arch, two-bay arcades and chancel arch are generally similar, though there are differences. Despite considerable renewal, they can be dated to the C14 by the hollow chamfers (continuous on the outer order of the tower arch), combined with octagonal piers and responds. Both west walls of the aisles have C14 lancets; the south one trefoiled and the north one with an ogee-head. However, the Burrell drawing shows the south aisle with two-light square-headed windows as today. According to Horsfield the nave roof was coved (I p524), which, if correct, would be consistent with a C14 date. Before the C19 the chancel had a C15 square-headed three-light east window. Shown best by Quartermain ((E) p53), it supports a C13 dating for the chancel as it is unlikely that a new window would have been inserted so soon if it had been C14. Possibly also C15 is a renewed pointed recess behind the pulpit, which may be the lower rood-stair entrance. A legacy in 1513 by William Wetherden, vicar, towards ‘the mending of the boteraces [buttresses]’ (SRS 41 p161) points to repairs then. After the Reformation, a dormer was added to the south aisle for a gallery, but the late C18 drawings show a church still recognisably C14. The restoration was early and The Ecclesiologist gives the details – the architect was R C Carpenter, one of its favourites. The earliest mention in November 1843 (p57) announces the restoration of the east window (actually three new lancets) and removal of the west gallery. By May 1845 (p140) the rest of the chancel was being restored, together with the north aisle windows, including a new east one which is still there, though it now opens into a vestry. Presumably the obviously C19 north porch and doorway were also included. 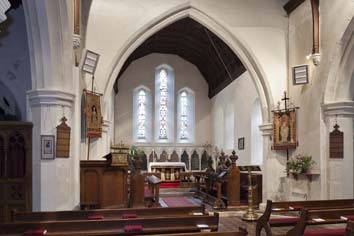 The south aisle was to be rebuilt as it was in poor condition. However, there appears to have been an interruption in the work and when the main nave was restored in 1853, the architects were A J Humbert and C F Reeks (WSRO Ep II/27/91), although Carpenter was still alive. They undertook extensive repairs to the arcades and the roof must date from the same time, with thin wallposts on foliage corbels; they may also have added the north vestry. A report in April 1856 (p157) announced the completion of the restoration. Both aisles were now wider (the 1845 report had implied restoration of the windows, not complete reconstruction of the north aisle) and the tower had been heightened slightly. The present west window must also date from then. There were further repairs in 1970 by J D Clarke and Partners. Those responsible were D Clarke and F E Ford (ICBS). Altar rails: Attributed to Carpenter (BE(E) p136). 1. Unidentified knight of c1360-70, thought from the heraldry to be a member of the Wardedieu family (2 p16). Though fragmentary, the elegantly curved body shows it is the only example in Sussex of the work of the London Series A workshop (see London workshops). There may formerly have been an effigy of his wife (ibid p14). 2. William Wetherden (d1513), vicar, whose legacy to the church has been noted. Small and relatively crude, though it is unusual to show the deceased in a shroud. 1. (South aisle, east window, J Powell and Sons, 1857 (Cash book), with decorative foliage and lilies. There is also some earlier C19 glass, of unknown authorship. 2. 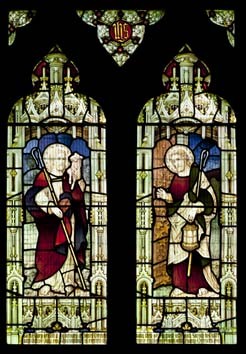 (South aisle, first window) Lavers and Barraud, 1903 (signed). Piscina: (Chancel) Plain and pointed, it could be C13 or C14. Pulpit: Supplied in 1845 by T Willement for R C Carpenter (Willement ledger). Sedilia: Restored triple C14, with moulded heads and curling stops. Stoup: (By north doorway and possibly reset). Plain but probably C14. My thanks to Nick Wiseman for all except one photograph.